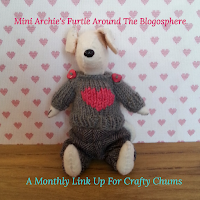 In June last year I went on a Bargello workshop run by my talented friend Beryl at her teaching studio and a month later I added the resulting project to my Finish-Along list. It's been on every list since, including my current one, and I'm thrilled to be able to say that it's finished! Dreadful photo, sorry! Still, at least you won't have to see it again after this! Once I got started again (it sat in a bag from July 2014 until last week! ), it didn't take me long to get the panel complete, even though I had to unpick three strips (two because I hadn't double-checked my seam allowance when I started and one because I made a daft mistake). The grey pieces towards the top right corner aren't puckered, it's just the way I plonked the panel on my bed! 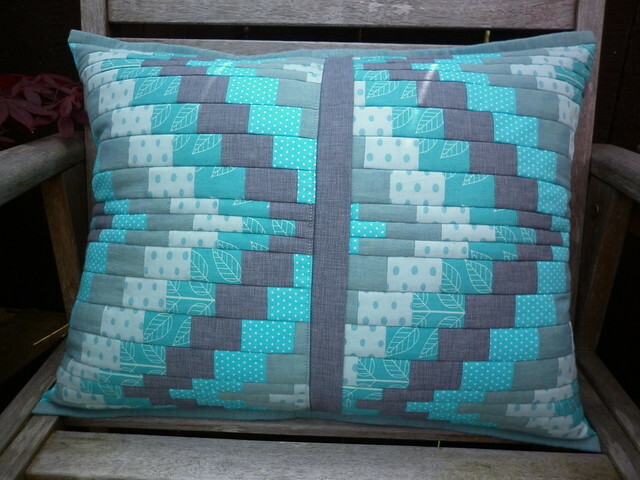 It finishes at 15" x 19" and was stitched with Aurifil 50wt 2600 (dove grey) throughout. I had originally intended to do a button closure but my button tin only had three suitable buttons and I was determined to finish this without buying anything else so I rummaged in my zip tin and found a suitable candidate. I'm rather pleased with how the back turned out and how (some of!) the lines match up! The cushion was supposed to be bigger than this (and square!) 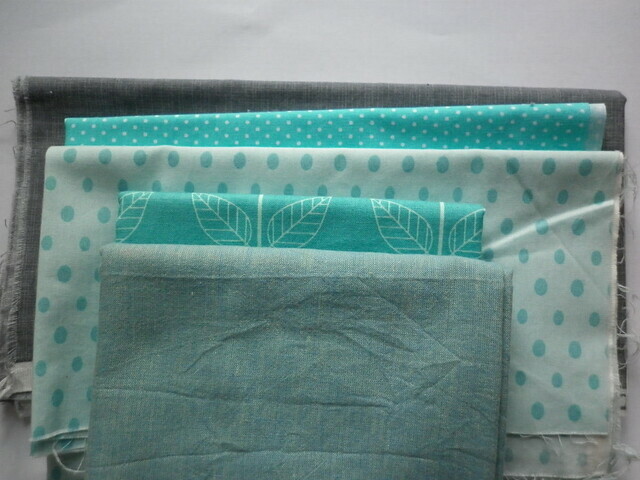 but, despite them all being bought in the UK, two of the fat quarters (the dots) were imperial, rather than metric, FQs so I didn't have enough fabric. Then I made a daft mistake with the first strip, discovered far after I was willing to unpick, (it was supposed to be a 'mammy' strip but I used a 'daddy' strip instead, which left me short a 'daddy' strip and no fabric to make another one. 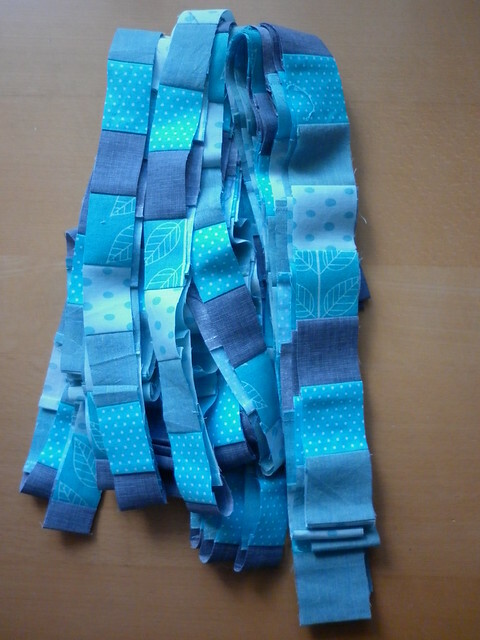 In the end, I trimmed all the 'daddy' strips to 'mammy' size and made a narrower panel) so a smaller cushion it was. I had just enough grey to cover the zip and just enough of the shot cotton to bind the top and bottom edges à la Sheila. To be honest, I think I prefer it as a smaller cushion as this way as it nestles nicely in the centre of my 'settee of friends'! I think I'm going to have to fill the other settee now! I can't fault their customer service! I've long wanted a thread colour card (rather than the printed one I have) and I must say that it lives up to all expectations - I quite want to put it up on the wall! Archie has been holding a 'lie in' - his demands are more biscuits, more patches of sun, more biscuits, more biscuits...and, have you guessed yet?, more biscuits. I have given in to a certain extent, just don't tell him he'd have been getting those biscuits anyway!! I'm going to lie here until I get a biscuit and I don't care how long it takes. I'll be linking up to Adrianne when the time comes! Thanks for popping in, I hope your FAL projects are also going swimmingly! Lovely finish and it already looks at home with the cushion family. Ooh fabulous ! It looks great with the others. 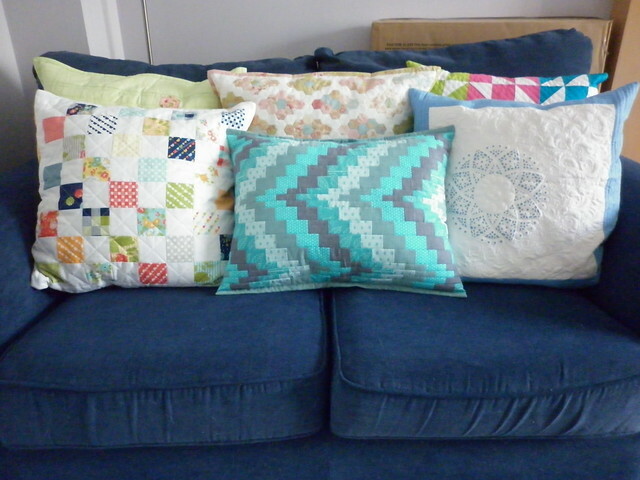 Already told you how much I love this bargello cushion! 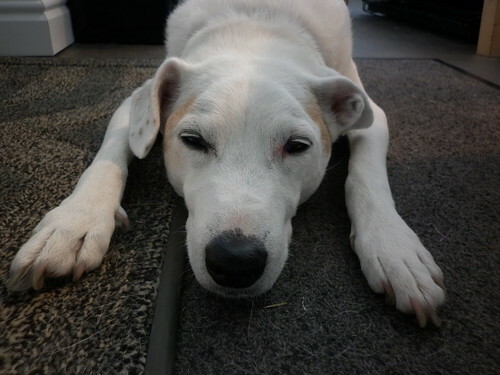 and give the dog the biscuit- he has clearly been overworked, and deserves another one! I love it, Helen!!!! I have strips in a container waiting to be put together for a Dahlia wall hanging. need to get to it!!! Helen...that is beautiful! Your makes are consistently beautiful. So precise and perfect and so not like anything I muster up! Love the colours too, simply lovely. Your group of cushions sure look great. The cushions are lovely, and…..
give that Archie another biscuit, please! Love him! Beautiful looking cushion cover! 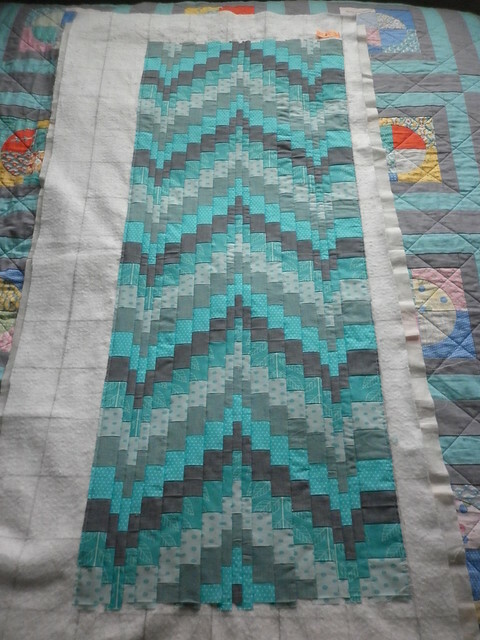 I love the idea of doing the bargello as QAYG - but as I distinctly remember swearing never to make another bargello (two small tries in my past) I will stick to pointing out this idea to other people rather than using it myself! Well done on finally getting it finished, it was well worth the wait I think! I hadn't been a big fan of Bargello until I saw this cushion! It's fabulous, and now I want to make one! I love your cushion. The colour is lovely. I think the longer shape suits the pattern too. 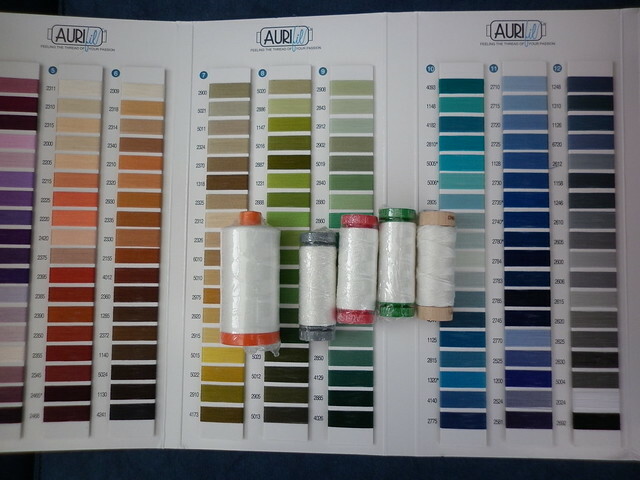 Really like how that turned out - nice of Aurifil to send you extras! 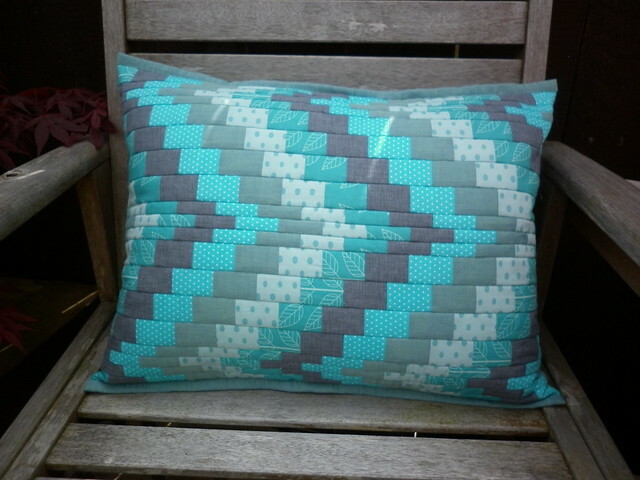 Such a stunning pillow - really love the shades of blue! ooo . . . Now I have found the Aqua cushion after it was "born". It looks amazing with its friends on the sofa! All the Daddies and the Mummies and the Babies would have done my head in . . I would have dithered and procrastinated and fed the poor boy more often than he needed. Lucky you are such a tough Mum!